The story behind my photo of a line of gondolas in Venice with a large modern cruise ship passing behind them. The photo above is a long-exposure taken at night. 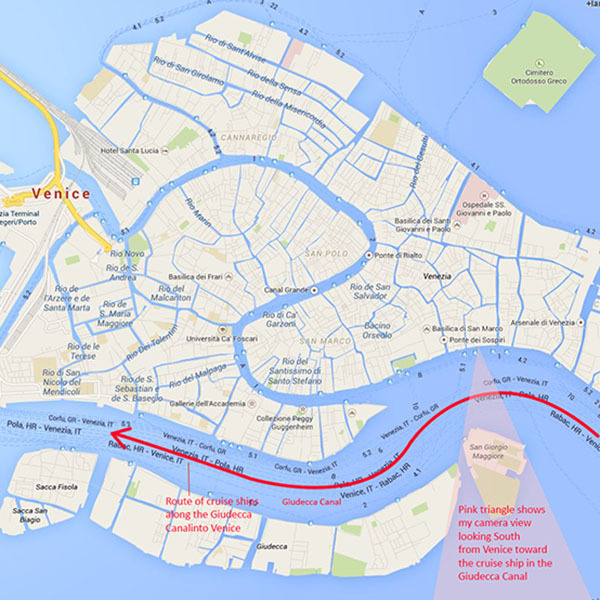 It shows a line of gondolas in Venice with a large modern cruise ship passing behind them. Due to the low light levels the photo was taken with my camera on a tripod with the camera’s shutter open for 4 seconds. 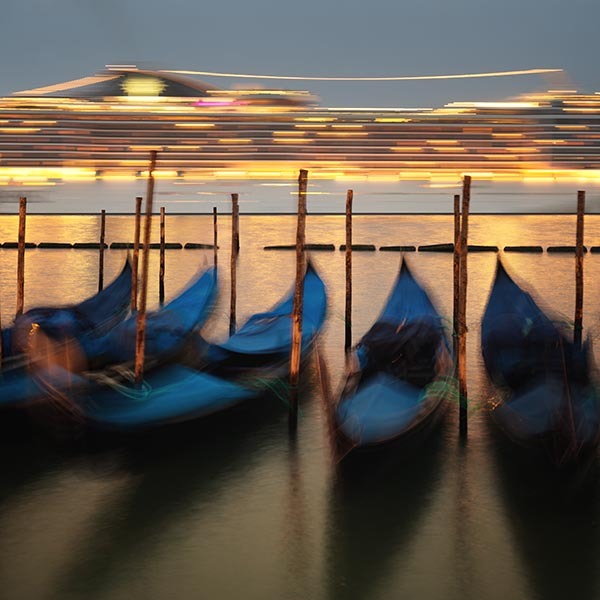 This has blurred the movement of the cruise ship and gondolas but not enough that they are unrecognisable. In October 2013 I spent an amazing week in Venice photographing the city. With my background and training in architecture I’ve always loved cities and Venice is widely recognised as one of the most beautiful in the world. Venice is very endearing with a harmonious and beautifully human scale – there are virtually no modern buildings and the myriad narrow canals that wind at random through the 117 islands that make up the city are busy with gondolas filled with tourists. It’s ironic that lots of these tourists who visit the city to appreciate its beautiful old buildings and small canals arrive on ultra-modern cruise ships like the one in this photo. These huge modern ships – some of them 15 stories high - make such a surreal sight as they pass close to the ancient architecture and small gondolas of the old city and I couldn’t resist taking a photo. My main interests lie in b&w photography rather than colour however on this occasion I was so surprised and pleased with the golden light cast over the scene from the cruise ship that I decided not to convert it to mono. Landscape photographers often work at dusk for the golden quality to the light and it struck me that the light from this cruise ship was like an artificial, man-made sunset. The authorities in Italy are deeply worried about the pollution and damage caused to the city by these cruise ships however the local economy and city authorities need the money that tourists bring with them. In November 2014 Italy introduced new laws to ban ships like this over 96,000 tonnes and to limit ones of over 40,000 tonnes to a maximum of 5 per day – this so concerned the local Venetian authorities that in January 2015 the law was overturned by the city’s regional court of appeal.